The Authorised Officer Report is accessed from the Report menu with a search form used to filter by search criteria. 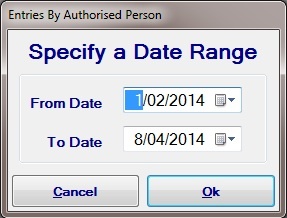 Setting a date range and clicking OK will produce a report of all entries between the date range. In this example, there is only one report in the system to be displayed.